Morgan’s Wonderland, an amusement park in San Antonio, Texas, made history in 2010 when it became the first-ever fully handicapped-accessible theme park. 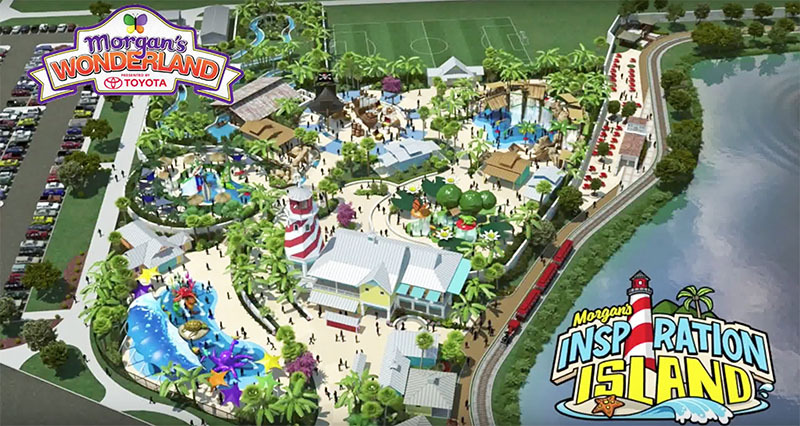 Now the company behind the park just announced it’s building Morgan’s Inspiration Island, a neighboring water park which will be fully accessible to children and adults of all abilities. Park officials held an event on Tuesday to confirm the news, and developer Gordon Hartman stated it would be the first of its kind in the world. Hartman’s daughter Morgan, who has cognitive and physical challenges, served as the inspiration for the theme parks. In 2005 the family launched The Gordon Hartman Family Foundation to find creative ways to provide positive opportunities for individuals with special needs and their families. According to a press release, the park will have a tropical theme, and it will include a river boat adventure ride and five water play areas. Like Morgan’s Wonderland, every part of the park will also be wheelchair accessible. Construction is currently underway, but due to the fact that so much equipment must be installed underground, it will take another year to complete, so the park is currently slated to open in spring 2017.